My lecture “Finding Your Passion and Running With It” includes a large trunk show of my quilts when the event is in driving distance. I now have my second lecture which follows and builds on my first lecture called “Cre-a-tiv-i-ty” – which one to choose? If I have spoken with your guild already, this is the perfect lecture for a return visit. I offer a variety of classes for all skill levels and many classes can complete their projects in one day, which builds confidence! I have a new lecture on creativity too. 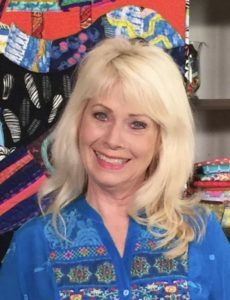 I look forward to sharing my Passion for Quilting with you. I do commission work for public and private collections and have pieces at UCI Medical, Kaiser Anaheim, Children’s Hospital of Orange County (CHOC), and the Navel Hospital Camp Pendleton. I have a long list of classes available which you can review on this website. Art has been an integral part of my life since I was a child. I remember always being intrigued and absorbed with making things. My mother encouraged my exploration of all things creative and my life-long creative journey took off including painting, sewing, photography, ceramics, embroidery, gardening just to name a few. My style, my passion, my energy is boundless… I love discovering, I love looking, I love seeing, I love the way others see, and I love doing! I look forward to sharing my story, work and passion with you. Guilds I have shared with – Some I have shared with twice and three times, so maybe – I’m doing something right? I also have listed Guilds I will be sharing with – perhaps your guild might be able to book me and share expenses, if I’m in the area?